When the Dsco platform processes any file, we call that a "process." A log for that process is stored in Dsco, which contains specific details and errors regarding each update. You can use these logs to review details of the process and resolve issues as necessary. Step 1: Select the AUTOMATION link at the top of the Dsco portal. Step 2: Select HISTORY from the sub-navigation area. The most recent process will be shown at the top of the list. 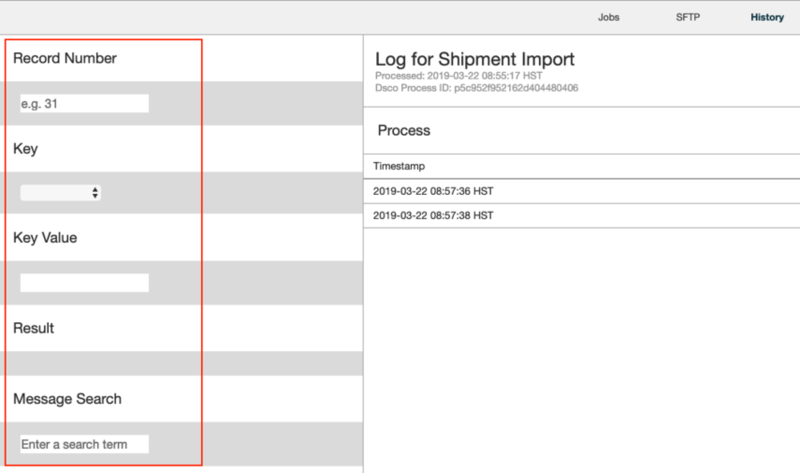 Step 3: Select the link under Status to drill down into the log data. Ready: The system is getting ready to begin processing and is waiting for an open server from the server pool. Assigned: The system has assigned the process to a given server but the server hasn't started processing it just yet. This process usually takes a split second so you should never see a process in this status. If you see a process in this status for more than a few minutes you may want to submit a support ticket at support@dsco.io to ask us to look into it. Running: The system is currently processing the uploaded file and is updating the Dsco database as it processes each record. Finished: The system has finished processing the file and all changes are now visible through the Dsco portal. If the process has finished but there is no link to select on, the system is finishing up the process of collecting all of the logs and the link should appear within the next few minutes. You will need to manually refresh the page to see the link once the system has all of the logs available for you to view. Failed: A process in this status indicates that the system was unable to process your file. The reasons for the failure could be one or several of numerous different possibilities so it is important to look at the details to find out why it failed. If the logs provide no information about the failure you may need to contact support@dsco.io for a deeper investigation. To help you find specific processes faster, Dsco incorporates filters on the left side of the process reports. You can search by Job Name, Date Range, whether the process Did Work on a file, and the Status. Within the specific process log there are additional filters you can use to find specific errors within the process. Simply fill in one or more of the search fields (Record Number, Key, Key Value, Result, or Message Search) and hit ENTER to filter the record. For example, to see only a list of items that failed, just click the Failed text and the process log will be filtered to only show the failed items. Dsco displays a number of entries per record as the system is doing a lot to ensure that the data provided is accurate and that proper feedback is provided for every needed change. If you have any questions about the content of the logs, please contact support@dsco.io. Make sure to include a direct link to the process history and our support team would be happy to help you research the issue. Unable to find UPC "________" within supplier ________. DSCO is unable to locate the UPC listed on the shipment data. The following EDI Segments are required for an 856 transaction but were not provided or not complete (______). The EDI file sent to Dsco is not in the right format OR is missing those segments in the data. Tip: Check the import job to be sure it is set to the right standard (DSCO, Nordstrom EDI, etc). PO ________ is not marked as "shipped" yet. Currently: shipment pending. The order cannot be invoiced because it has not been given tracking/shipment data. Once the order is marked as shipped within Dsco the invoice can be resent. Unable to invoice quantity 1 for SKU " ________", 0 are left to be invoiced. The order has already been invoiced for the SKU and, therefore, cannot be invoiced again. SKU "________" is not available for invoicing because it is marked as "cancelled." The SKU on the order was previously cancelled and cannot be invoiced. The invoice does not include one or more SKUs that were originally on the order. DSCO will still process the invoice even if only some of the ordered SKUs are included. Warning: The extended cost on invoice ________ does not match the expected cost. There is a difference of ________. This warning indicates that the amount given on the invoice did not match what Dsco was expecting. Keep in mind that the invoice has still processed successfully, but you may need to contact your trading partner to address any differences in what you're expecting to receive versus what they're expecting to pay. The requested po_number (________) could not be found within account ________. The PO is not in that Dsco account. Check the PO number on your import or the Dsco account (if using multiple accounts).